Studio Movie Grill and Warner Bros. Pictures were looking for real-life women superheroes — women who go out of their way to make their communities better places and exhibit power, grace and wisdom. Sandra Young, founder of Mixteco Indigena Community Organizing Project (MICOP), was selected as one of these superheroes. MICOP unites indigenous leaders and allies to strengthen the Mixtec and indigenous immigrant community in Ventura County, estimated at 20,000 people. Most are strawberry farmworkers, and many speak primarily their indigenous language. MICOP’s majority-indigenous staff builds community leadership and self-sufficiency through education and training programs, language interpretation, health outreach, humanitarian support, and cultural promotion. They organize the community to advocate for shared concerns. MICOP reaches approximately 6,000 individuals each year. Young was one of more than 700 nominees submitted for the superhero search from around the country. Each of the recipients were chosen based on dedication to helping others, resiliency in the face of tough circumstances, and professional achievements. In 1997, upon completion of her Nurse Practitioner’s degree, Young joined the staff at Las Islas Medical Clinic, a community health center in Oxnard. Young recognized that there was a growing need for promotores, community health workers from the Mixtec community, in addition to the outreach programs through the clinic. In 2001, she decided to form a nonprofit, apart from the clinic, which became the Mixteco/Indígena Community Organizing Project. Young still fields calls from other parts of California on how to replicate services for indigenous populations in other communities. Mexican roots from the states of Oaxaca and Guerrero. The term “Tequio” describes an indigenous person’s desire and obligation to assist their community. We provide these grants in the spirit of Tequio, and we seek to support highly motivated students who share this commitment to serve their community. As you climb, may you lift your community with you. 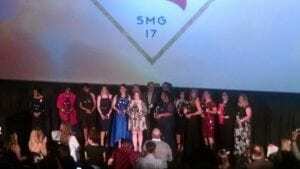 Young and the other 11 “Real Life Women Superheroes” were flown to Dallas for a red-carpet screening of “Wonder Woman,” and were also presented with Studio Movie Grill’s Opening Hearts and Minds Award. The recipients also received a $1,000 donation to their charity of choice.